With such a line-up the expectations are obviously very high. After the first spin I didn't know what to think of it. There is certainly no doubt about the technical skills of the musicians. The songs are technical, progressive, virtuoso and heavy all together. The vocals of Fred are as good as expected and the bass-lines are incredibly technical and fast. The keys and piano-parts give the album the melodic and finishing touch. This is an album that doesn't stick just after one spin and aren't those the better albums? Meanwhile I have listened to the album time after time and it is just now that it blossoms. I think this is an album that will be a milestone when looking back in a few years. The aggressive opening track "Relentless Chaos", the more progressive song "Inner Self" with Lance King as guest, the melodic and threatening song "Endless Journey" and on top of that my favourite track "Your Decay" - this song has everything what a good song needs; speed, hammering drums, excellent guitar work, superb singing, slower more serene parts followed by aggressive ones and an acceleration near the end. After this firework we can rest a bit with the ballad "Beyond Despair". After that the songs continue in the same high quality. As a bonus on the first edition we get a nice version of Iron Maiden's "Powerslave", it comes close to the original. 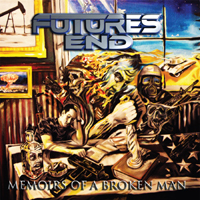 Put Symphony X, Coheed and Cambria, Fates Warning and Iced Earth in a blender and you get something like Futures End. When listening for the first time, don't make any hasty conclusions, let the album grow and in the end you will understand and agree with me that this is one of the better technical progressive power metal albums this year.